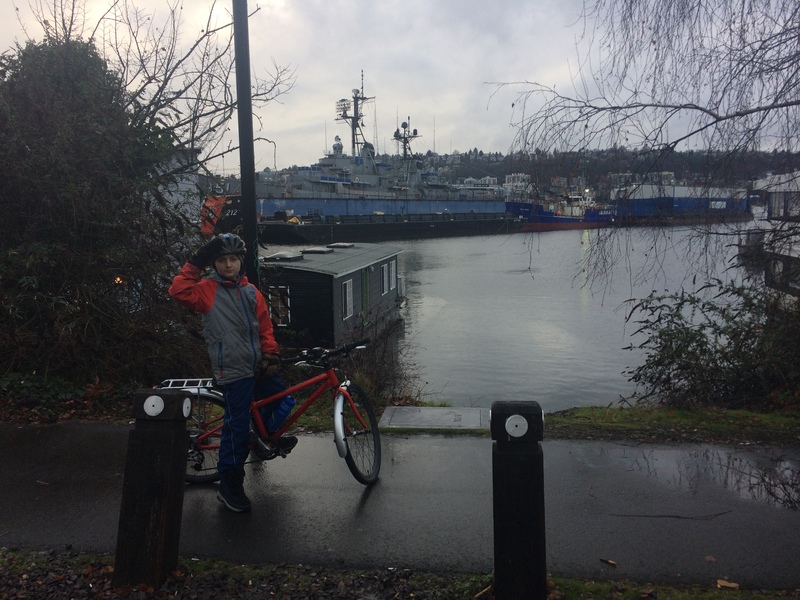 We’ve biked around Lake Union several times on Thanksgiving (here’s how our 2016 ride went), but we always go in the clockwise direction. 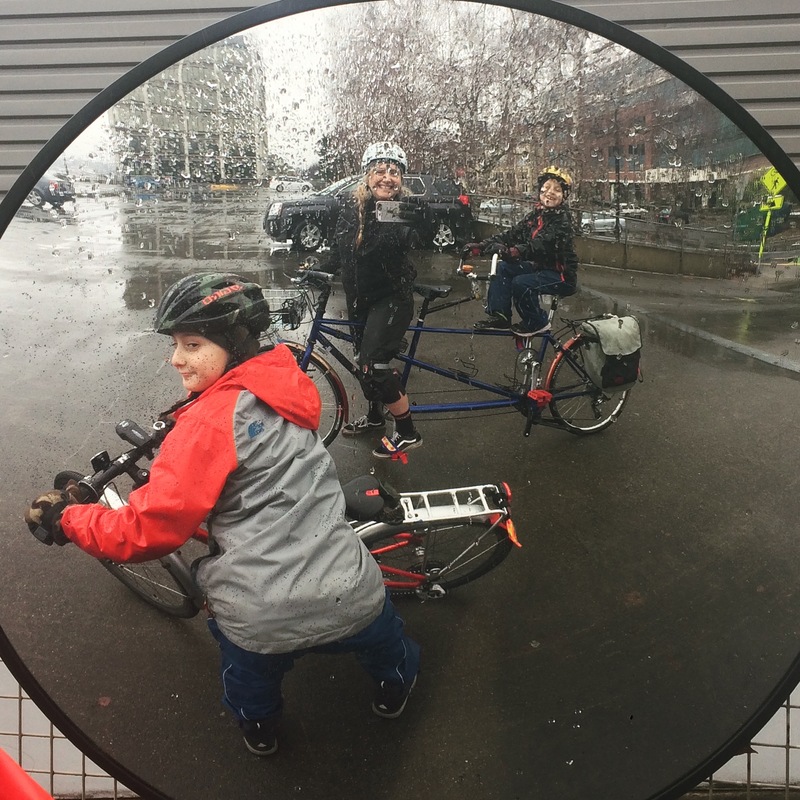 Today was errand-based (kid 1 wanted to see a boat and kid 2 needed a new bike helmet) so we didn’t follow the Cheshiahud Loop as closely as we do on Thanksgiving, but it was useful to see it in the opposite direction…and makes me like the clockwise loop all the more. 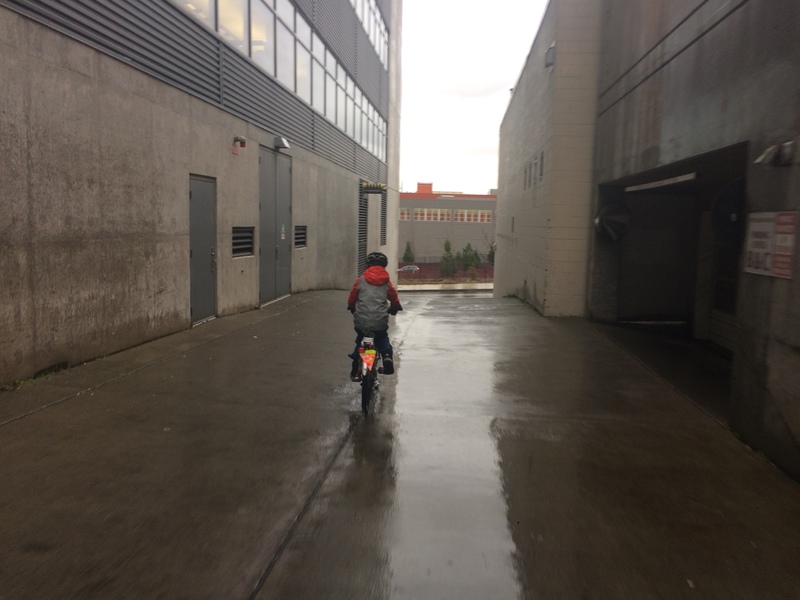 My nine-year old rode his own bike and the seven-year old rode the tandem with me. He just got over a cold and didn’t want to ride his own bike. Which was fine by me because it’s certainly a lot easier to have one loose kid than two! It’s been almost four years since we got his last helmet at Velo Bike Shop so he wanted to go there again. Awww, toddler! 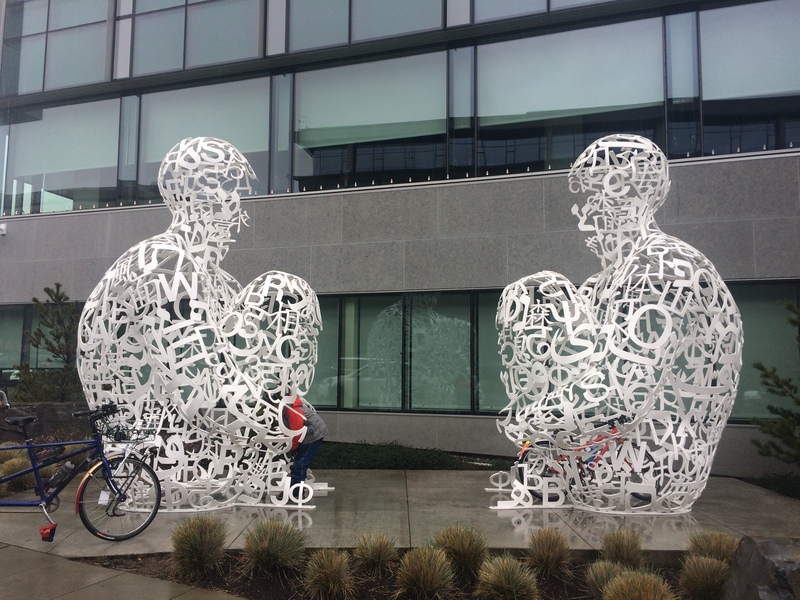 Today was super rainy and Velo proved a great stopping spot. We found a new helmet, admired the old bikes hanging from the ceiling and walls (triple tandem! penny farthing! ), and had a long snack at the cafe tables in the adjoining hallway of the Via6 building. We didn’t go into the Home Remedy grocery store/deli in the building, but had we not had snacks along with us, it probably would have been a good resource. Drinking fountain and potties are also located in the hallway–everything one could possibly want! From there we went to the flagship REI. We didn’t need anything there having already found the helmet, but you can’t mention flagship REI to kids in the morning and then not go. We usually hit REI from the other side and I never seem to find the same route twice if I approach from South Lake Union rather than Eastlake. 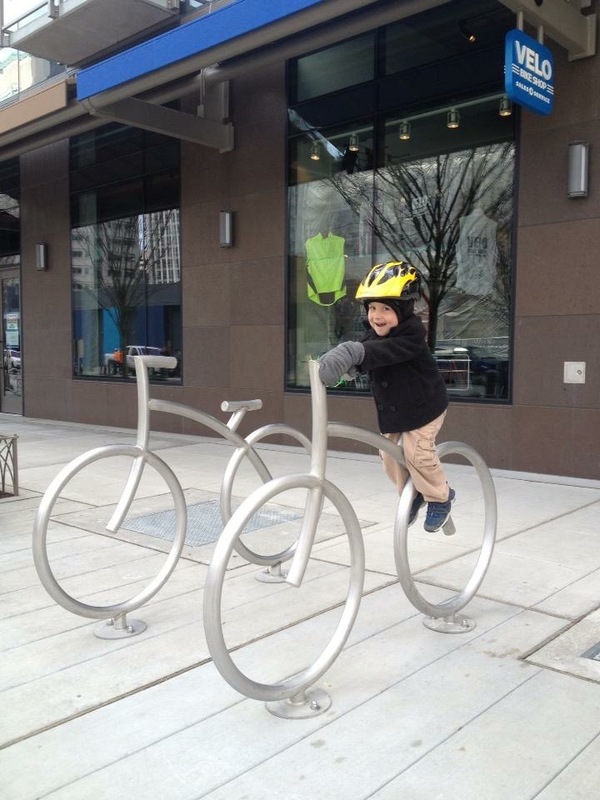 With the one kid on his own bike, we stuck to the sidewalk for part of the way–primarily Westlake and Thomas for the portions with street car tracks. Thomas had one steep hill and the road was very patched and pitted due to construction, but it was a good street and I’d use it again. Here’s the Strava recording of our 10-mile loop. REI was awesome. There’s a play area upstairs and a World Wrapps right next to it–inside the store! So we let our gear dry out (somewhat) while playing and lunching. We left via Thomas again, but rather than turn down Fairview as I had planned, I saw an enticing alley just before it. Fairview is very busy and I had planned for us to ride the sidewalk, but even though it’s legal (and necessary) in Seattle, I prefer to avoid it if I can. The three blocks of alley were great! Safe enough for my cautious nine-year old to want to ride ahead of me, even! That doesn’t often happen. The alley ended at Mercer so we were on the sidewalk for a bit, including the Fairview Avenue part of the Cheshiahud Loop, for which we ride in the street when going the other direction. It sort of feels like salmoning (heading against traffic in the street) for the last block before seaplanes, but the dividers make it more of a trail than a street, I guess. It’s only awkward at the very end where it’s only wide enough for a single bike and not a full lane. I think we could have snuck off into the adjacent parking lot just before it got narrow, but I just plowed on ahead this time. And soon enough we found the boat! The USS Turner Joy is currently visiting Lake Union Drydock Company for repairs. We usually see it in Bremerton on the way to bike camping at Illahee or Manchester. Yesterday we watched video of it coming through the locks on Thursday. We got a couple glimpses of it from the west side of the lake, but right by the dry dock is the place to really check it out. I decided the super steep parts of the two-o’clock section of the Lake Union loop are worse in the counterclockwise direction, but I’ll admit I’ve always been more comfortable with the hill I know over a new hill. My nine-year old rides the hills on Thanksgiving and opted to walk both up and downhill today, but it’s gotta feel a bit different when you’re charging ahead of the adults with a pack of friends versus all on your own. One last little note on the day: since we weren’t able to find a “black helmet with red flames like two friends at school have,” my seven-year old selected some stickers at Fun Reflector to make it work. Stickers can’t fix everything, but they can fix a lot of things! When the little kid was ready to move from his 16″ bike to his brother’s 20″ bike before his brother thought he was ready to move up to the new 24″ bike, I got them custom decals at Do It Yourself Lettering and once they saw their steeds labeled “Officer Brandt” and “Darth Rijder” it was all good!